It is in effect until 10pm. 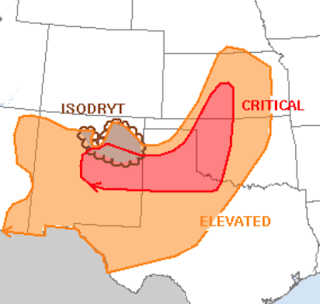 Please note there is a "moderate" chance of strong tornadoes and a "high" likelihood of large hail. 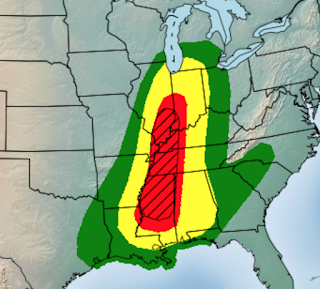 So, please prepare accordingly as storms begin to develop across the area. UPDATE 8:38pm. Quite of bit of damage is reported across the north Tulsa metro area. The tornado passed north of the airport. 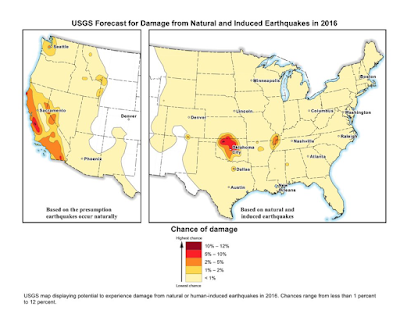 The Stone Canyon neighborhood seems to have been hard hit. 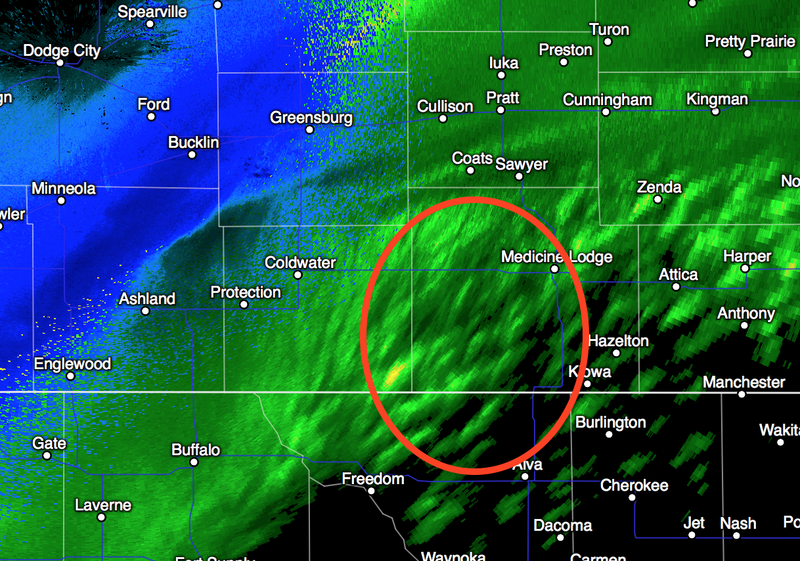 Farther east, there is an unconfirmed report "Claremore got hit pretty good." This likely overstated the damage. 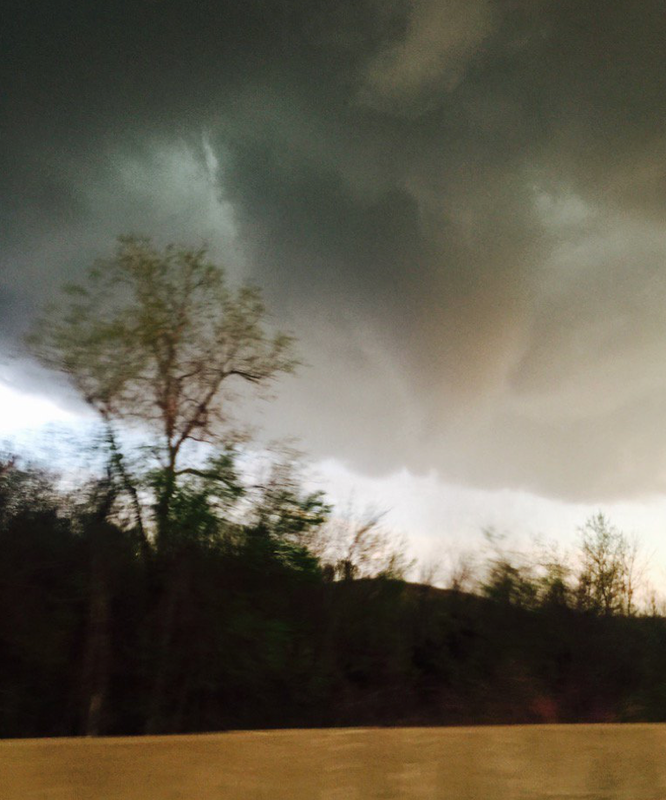 However, just south of Claremore there was a strong tornado. 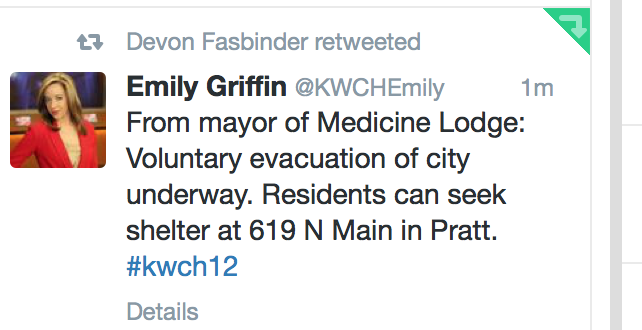 There is a report of 9 serious injuries, so far. 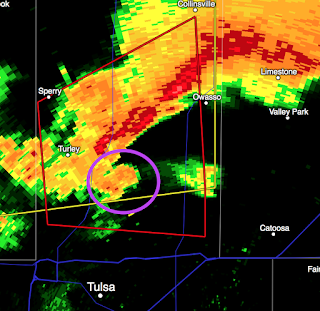 While unknown the extent of any damage, a tornado is moving through the north part of the Tulsa Metro area. Here is a photo of the tornado itself around 7:20. And, here is the tornado's signature on radar at 7:24pm. It was in the vicinity of the Tulsa Zoo. We have severe thunderstorm watches (salmon color) out from about Wichita through Oklahoma City to the DFW Metroplex and southwest to Waco. A tornado watch has just been issued (yellow) for the Ark-La-Tex region. 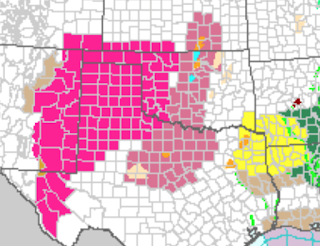 The various amber polygons are severe thunderstorm warnings. 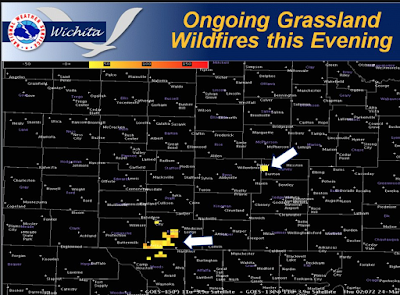 The red color is a wildfire danger warning. 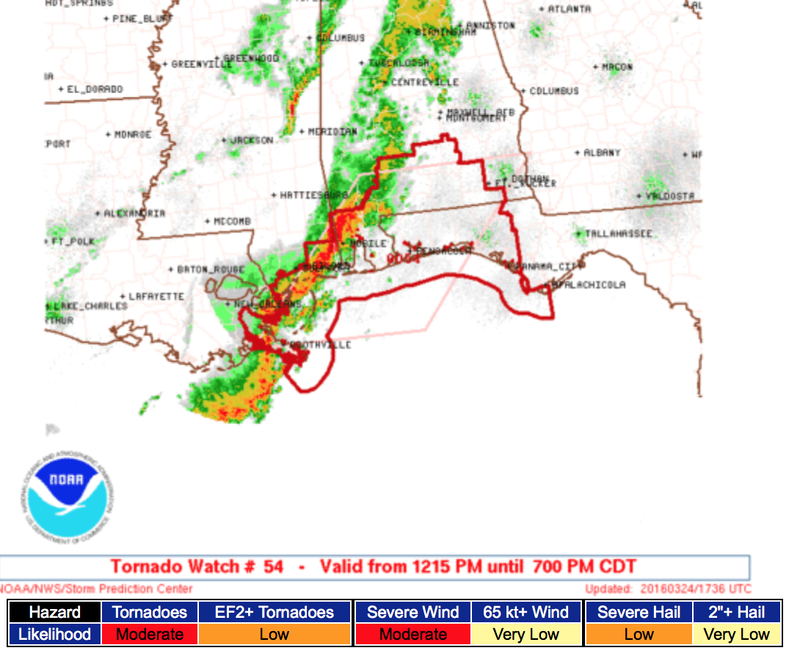 If you are in the watch areas, especially the Ark-La-Tex region, please monitor local weather sources if and when thunderstorms approach. Here is a heads up for the South for Thursday. 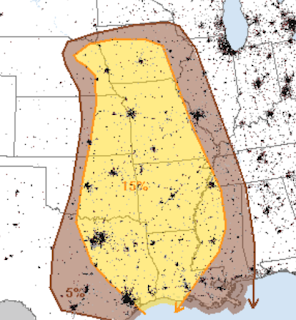 The hatched area is where very large hail and a few strong tornadoes may occur. I'll update on this threat tomorrow morning. 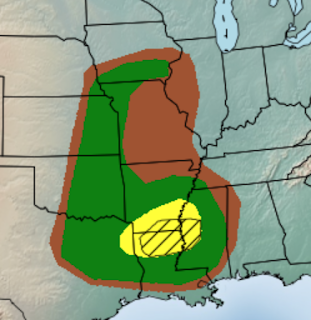 Meanwhile, I'll have an update this afternoon on the tornado threat in the Central and Southern Plains that exists through this evening. 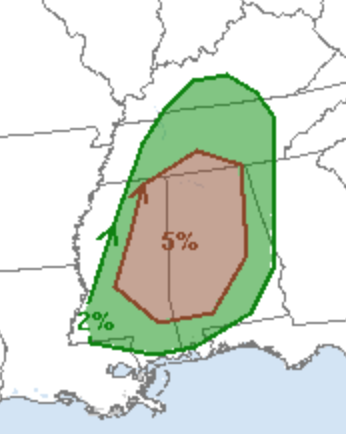 The SPC is forecasting a significant tornado risk in the area shaded in green (5%). 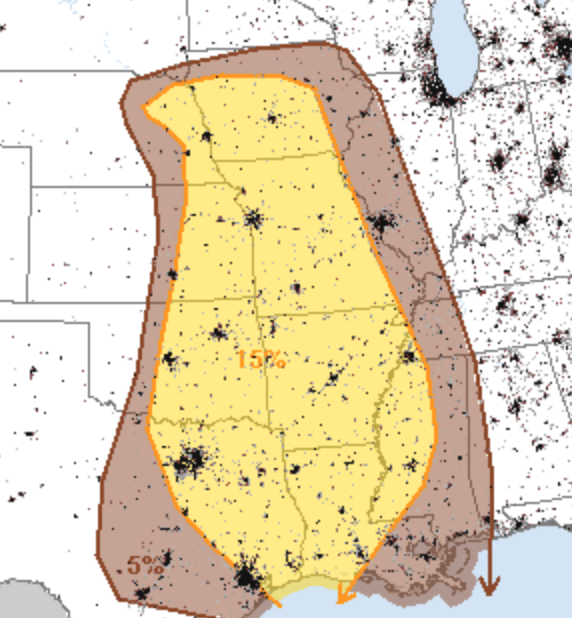 In the yellow area, the probability is 10% and, where you see hatching, strong tornadoes are forecast to occur. So, if you live in these areas I urge you to keep up on the weather at the first sign of the approach of thunderstorms. 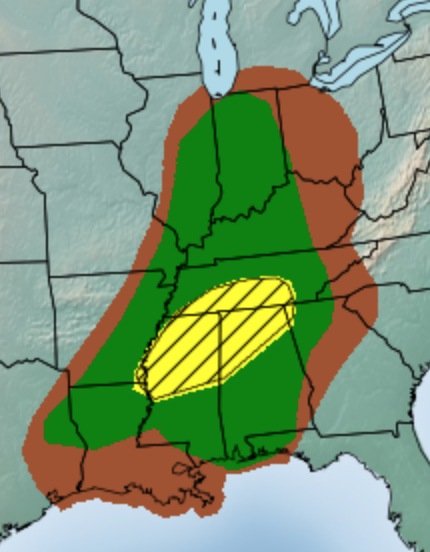 There is a risk of tornadoes and severe thunderstorms tomorrow in the area shaded in yellow. I'll have an update on this tomorrow morning. With photos from Craig Hacker, here. 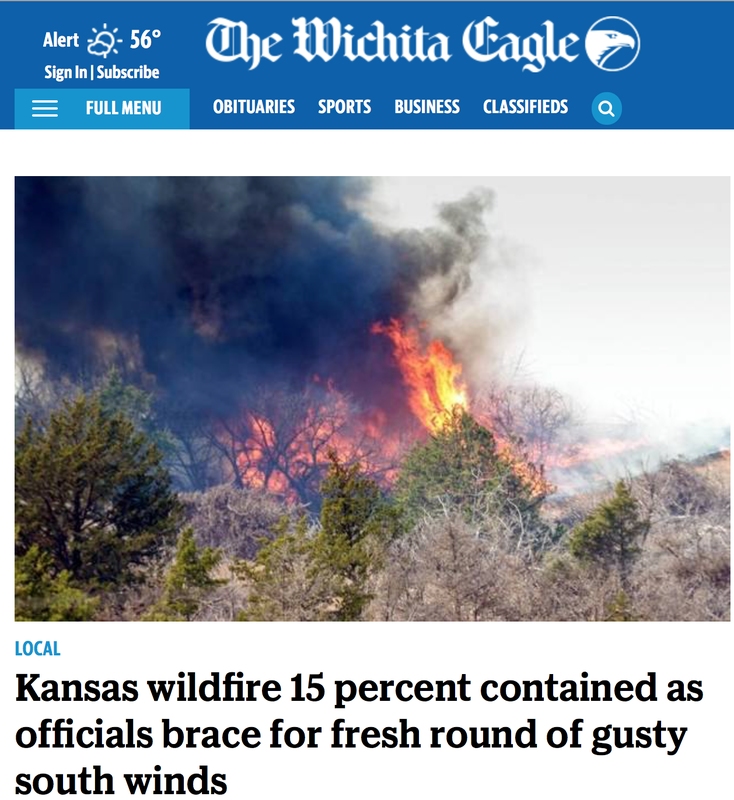 The Wichita Eagle has details. 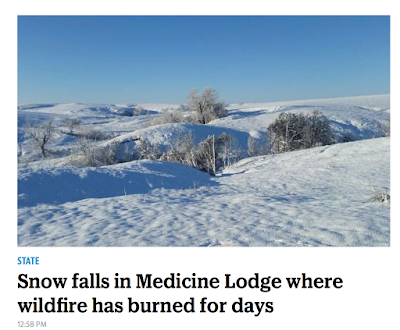 The fire, for all intents and purposes, was extinguished by the rain and snow that fell overnight. 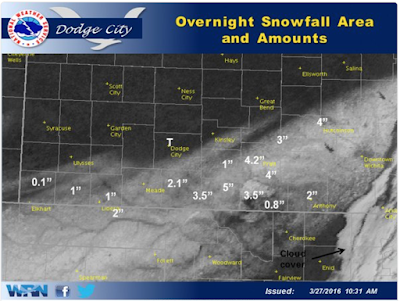 Here is a map showing how much precipitation has fallen. 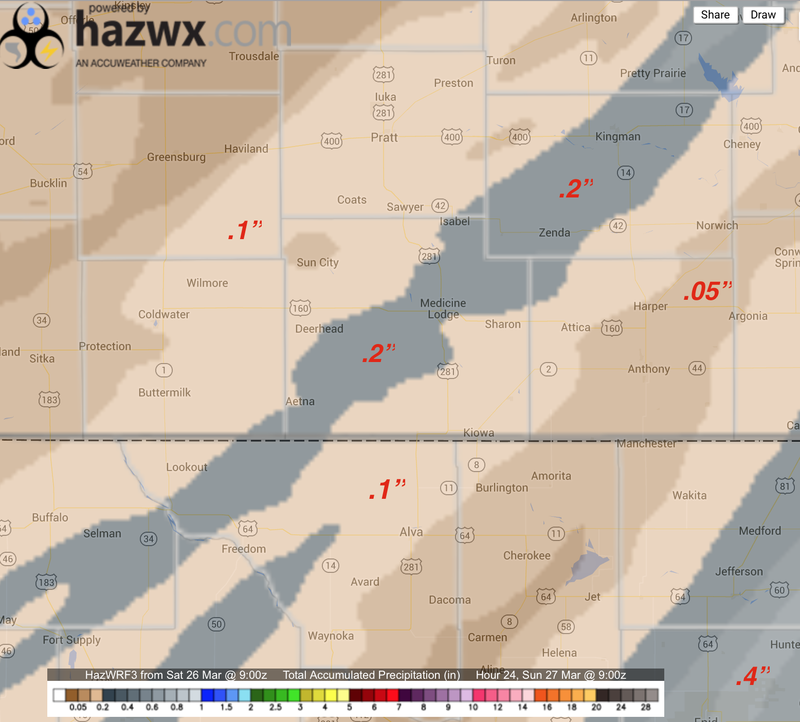 Dual polarization radar shows that more precipitation feel in central Barber Co. than the automated rain gauge reported, so amounts in that area were questionable. While it is a shame this trestle burned, starting around :20 I think you'll agree it is certainly a unique video. Here are maps of the snowfalls. 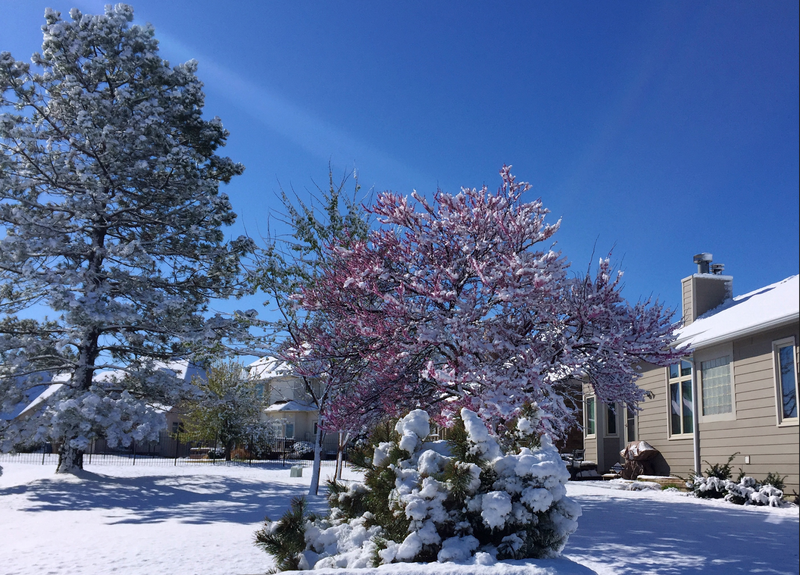 In our part of the country, this is the first snow of the season. It is the perfect snow in the sense that the roads were warm enough it melted on them. 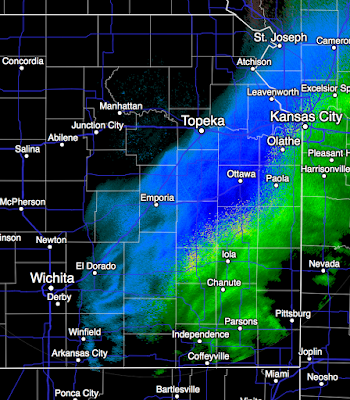 As of 7:50am, you can see the snow/rain line on radar. 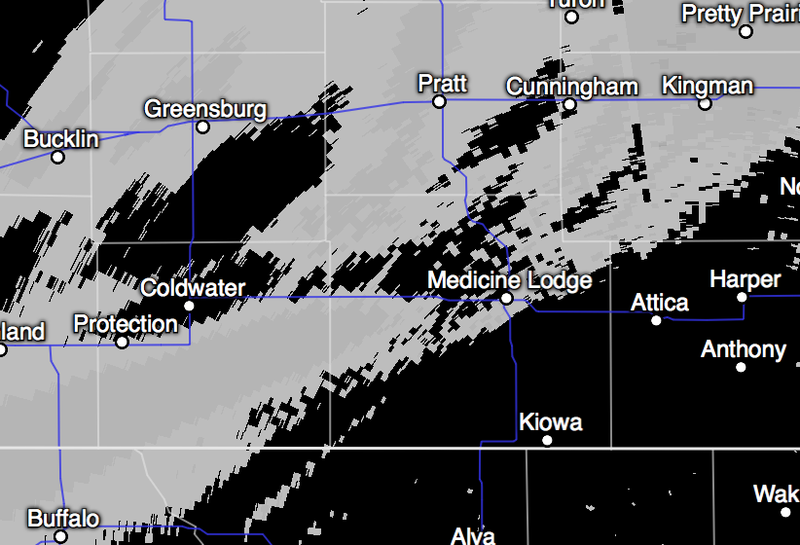 While the official rain gauge readings will not be in for another hour or so, from dual polarization radar, it appears that the entire Anderson Creek Wildfire area received substantial moisture with most all of the area receiving at least a half-inch of precipitation. 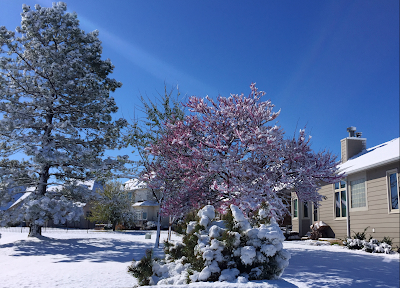 Certainly a joyous Easter in the Gyp Hills region. Sunday Fun: Ginger Zee on "Dancing With the Stars"
A personal note: When I was in college, and early in my career, there were almost no women meteorologists. There was just one woman in my graduating class at the University of Oklahoma. 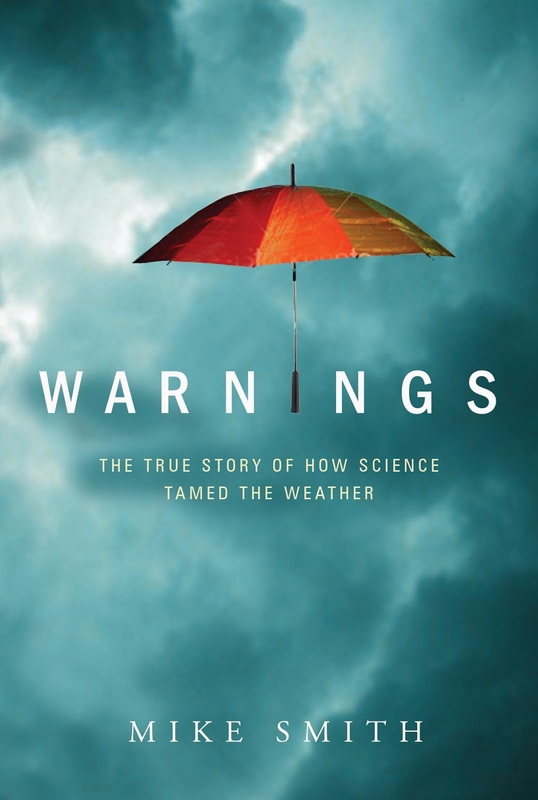 Women were actively discouraged from pursuing meteorology as a career. Some of us pushed back -- hard -- against that culture. 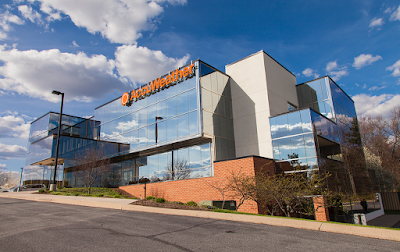 I hired only the second woman to get the American Meteorological Society's Television Seal of Approval and have tried to hire qualified women and minorities ever since. I've really enjoyed watching meteorologist Ginger Zee on Dancing With the Stars. Not only is she a great dancer, she has always been a terrific role model for other young women. It is fun to see her dancing with such zest. 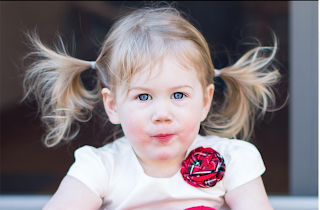 If you haven't seen Ginger dance yet, she'll be on ABC again tomorrow evening. WuShock appears with some of his Easter peeps. 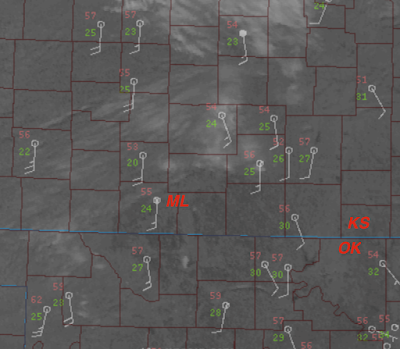 Mindy, Forecaster Evie, and I wish you and your family a very happy Easter. Here is the 11:50pm AccuWeather Regional Radar. 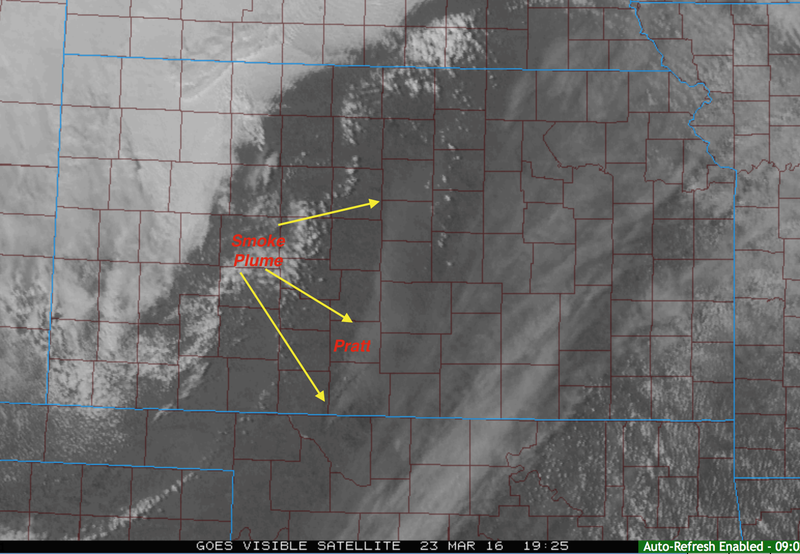 Yes, those are thunderstorms in southwest Oklahoma and in Texas near Wichita Falls. Here is the Dodge City radar as of 11:50pm with an algorithm that shows precipitation type. 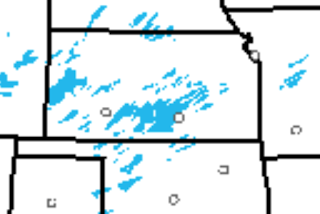 Blue is snow with darker blues = heavier snow. 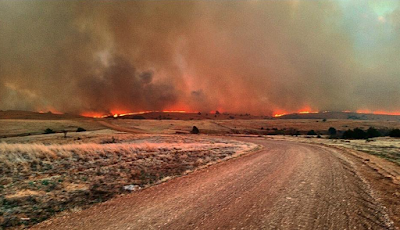 Precipitation is now spreading over the fire area. 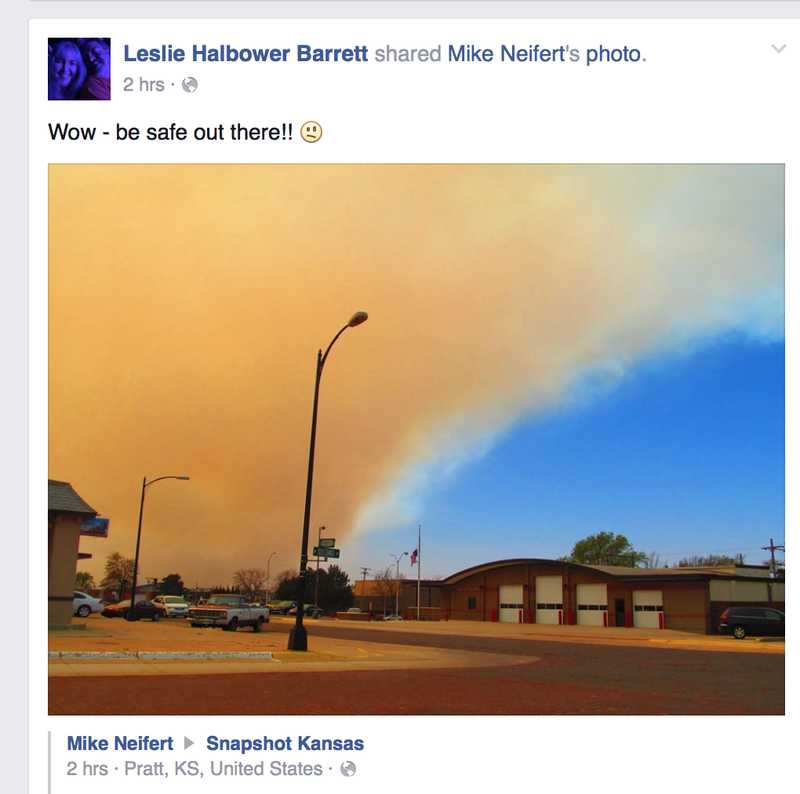 Very encouraging for controlling the fire. Here is the 4km WRF run from 7pm data. It has over an inch of precipitation falling in part of the fire area and the entire fire area receiving at least 0.4 inches which should be sufficient to allow the fire, currently 31% contained, to be controlled. The forecast for the City of Medicine Lodge is an amazing 1.46 inches!! 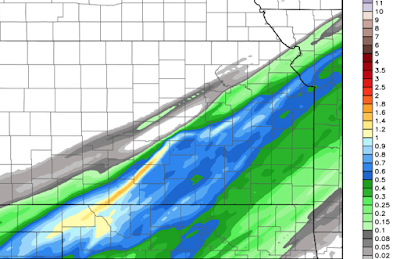 At the lower end of the spectrum (and, probably, more realistic) is the GFS. 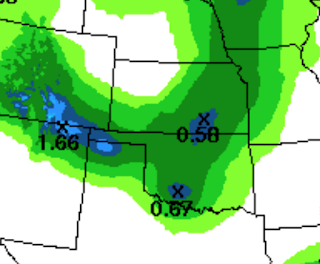 Medicine Lodge (center of burn area) is forecast to receive 0.49 inches. 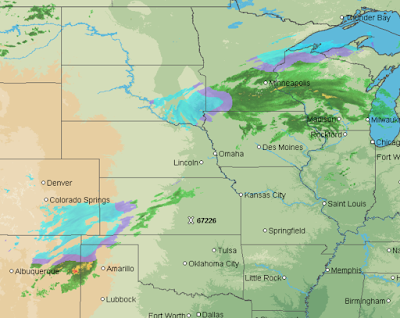 Here is the radar at 7pm over the central U.S.
At 7am Easter Sunday, it will be snowing around the Twin Cities and in the counties near the Kansas Turnpike. In some areas it will snowing hard but temperatures should be a degree or two above freezing. 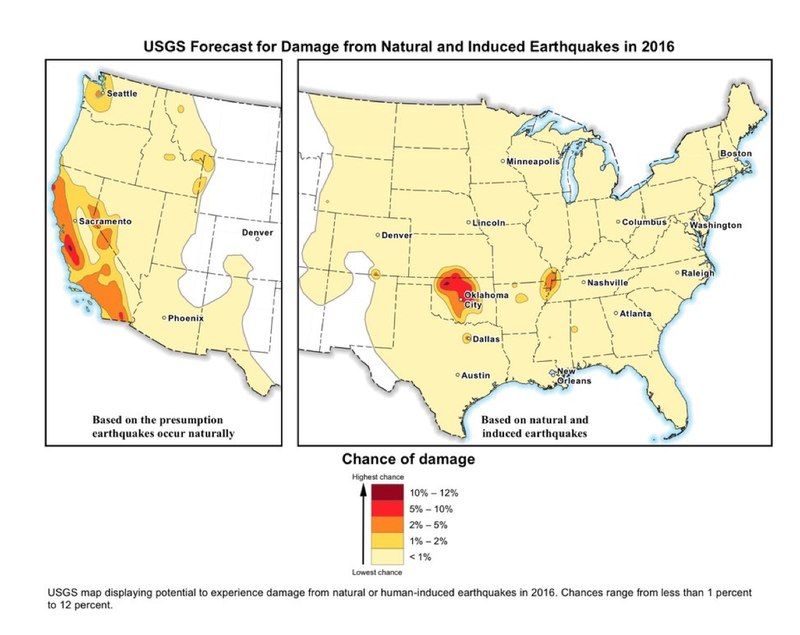 So, you may wish to prepare accordingly. 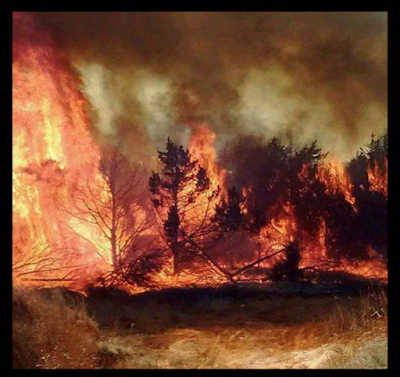 Via Facebook and Jary Mclean comes this photo of the Anderson Creek Fire in Comanche County, Kansas, Friday. 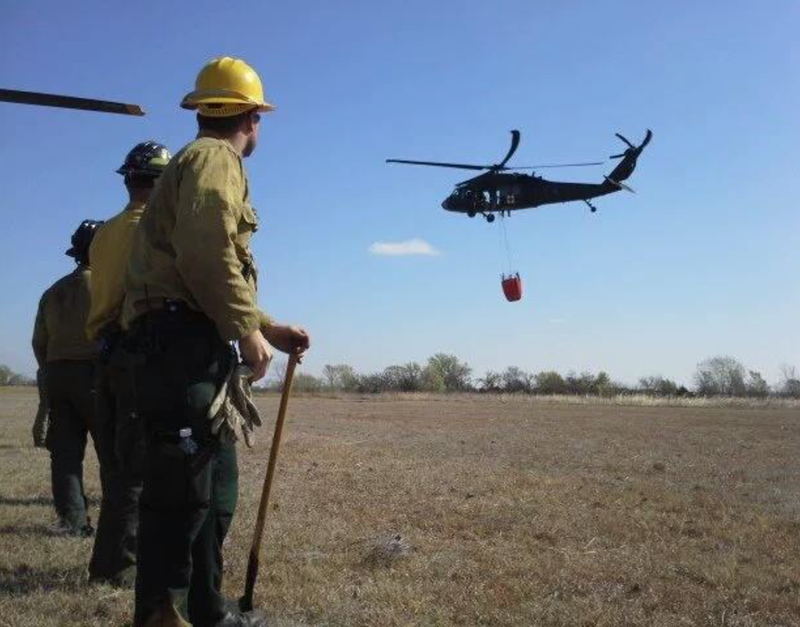 A few minutes ago Chip Redmond, meteorologist with the Kansas Forest Service, shared this photo via Facebook of one of the National Guard helicopters taking off carrying a 660 gallon water bucket which will be dumped on the fire. 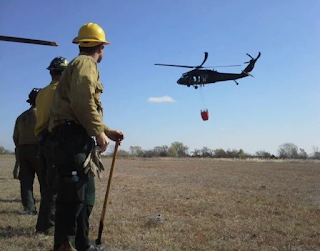 The copters drop into area lakes to fill the buckets. Now, the very good news. The computer models that have ingested the weather balloon data from the 7am launch are forecasting much more moisture in the fire area. 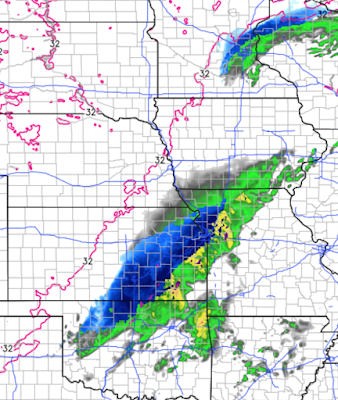 No precipitation is forecast before midnight tonight. 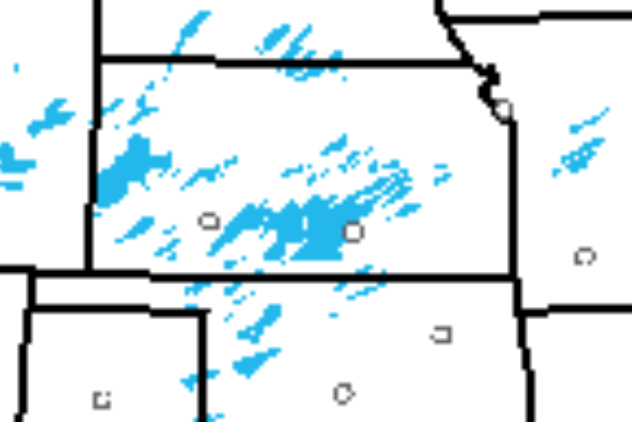 Here is the range of forecasts: 4km WRF. Over = Anderson Crk Fire area. W=Wichita. 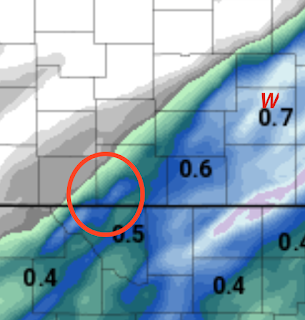 The GFS is the most optimistic with as much as 0.8 inches in Barber County. So, the rainfall amount forecasts range from about a tenth of an inch in western Comanche County to a third of an inch in Barber Co. to about three-quarters of an inch at the high end. 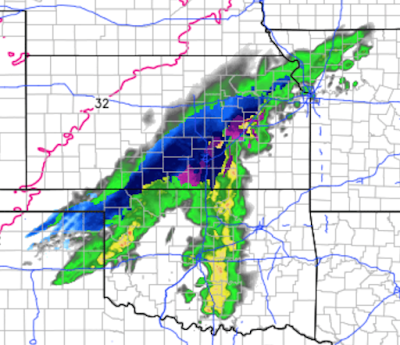 Here is the forecast radar for 3am Easter Sunday morning. Yes, the dark blue is snow. Some areas of central and eastern Kansas could have accumulating snow. 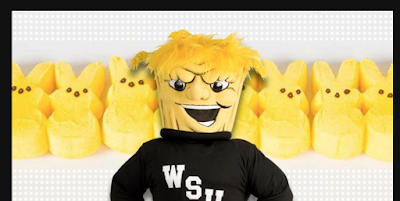 A few prayers this Easter Weekend would be appropriate and appreciated. 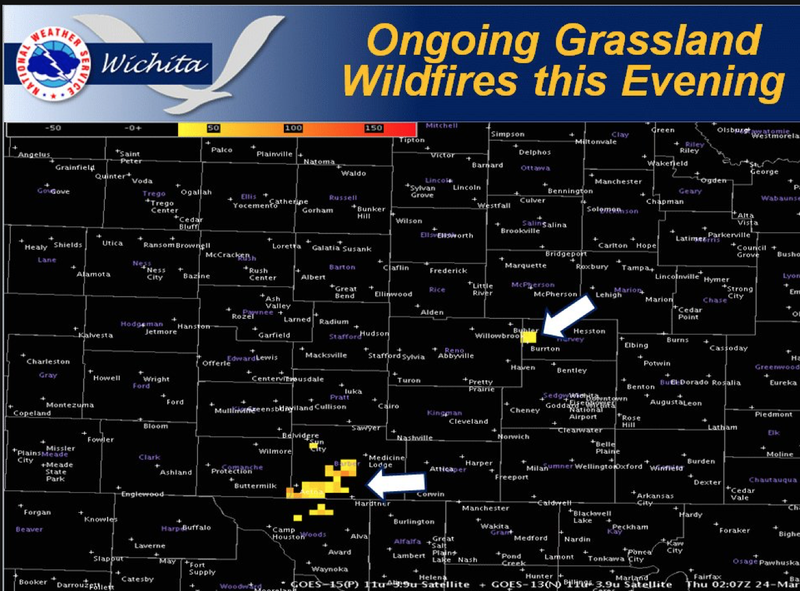 Here is the latest on the Kansas Wildfire situation and how the weather is affecting it. 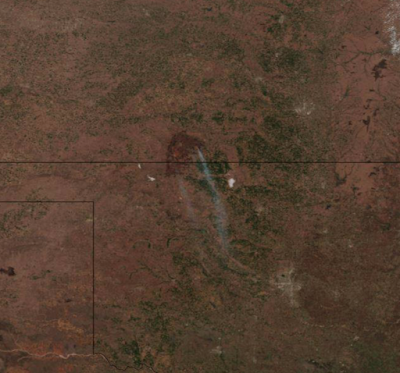 This image was taken by a geosatellite Friday and it shows the burn area in southern Kansas and northern Oklahoma. 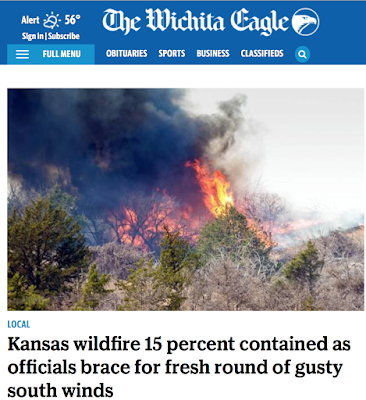 As of this morning, according to The Wichita Eagle, the fire is 15% contained. Last night, rain fell in much of the fire area with the band from south of Goldwater to Medicine Lodge receiving as much as two-tenths of an inch. 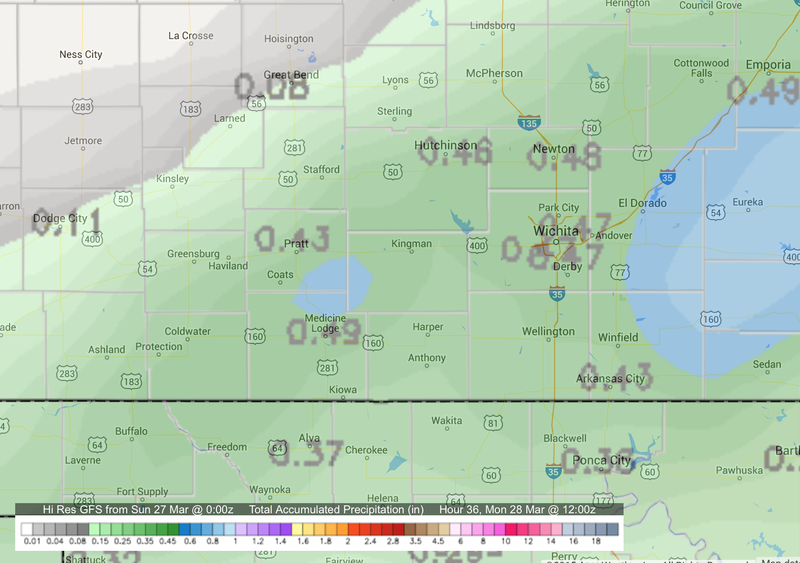 Unfortunately, the rain did not fall over the entire area. 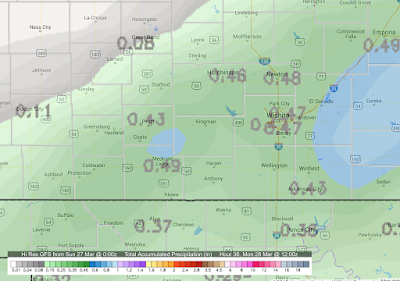 AccuWeather's computer model is forecasting an additional .1 to .2 inches of rain over the burn area after midnight tonight. 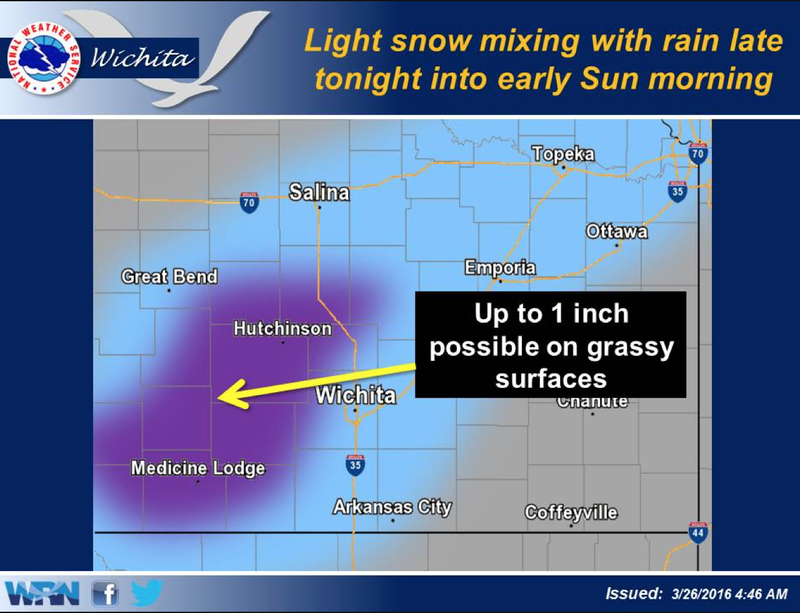 The NWS in Wichita is calling for up to an inch of snow in the fire area late tonight and Sunday. Again, this would be helpful with the cool, humid air. 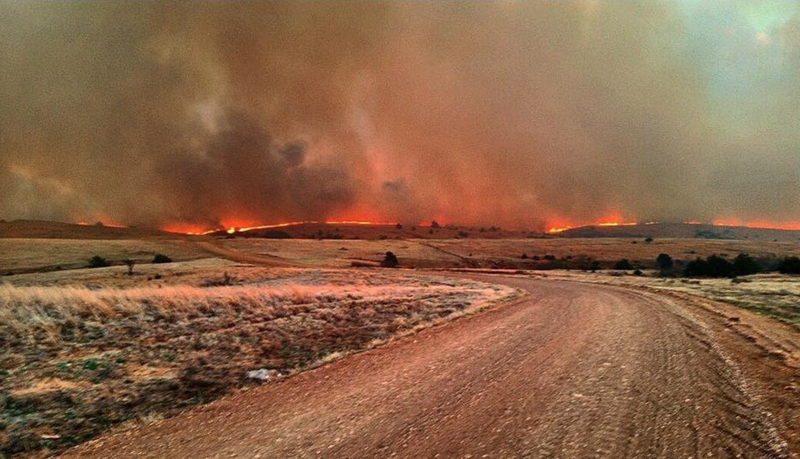 We salute the firefighters and others who have worked so hard to contain and extinguish the fire. With a hat tip to Lily Wu, here is a video showing the fire and the people working so hard to help out. 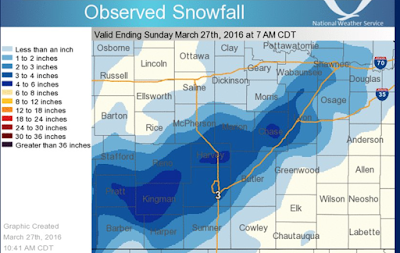 Forecaster Evie is right again. An area of rain has developed west of the burn area (circled) at 6:52pm. 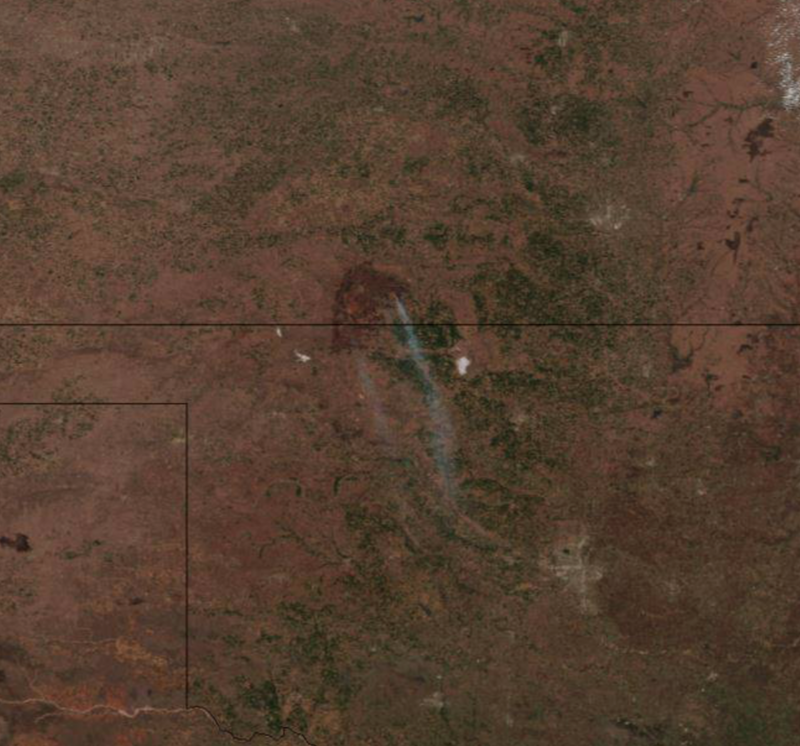 Please also note that lightning has developed west of Laverne, Oklahoma. 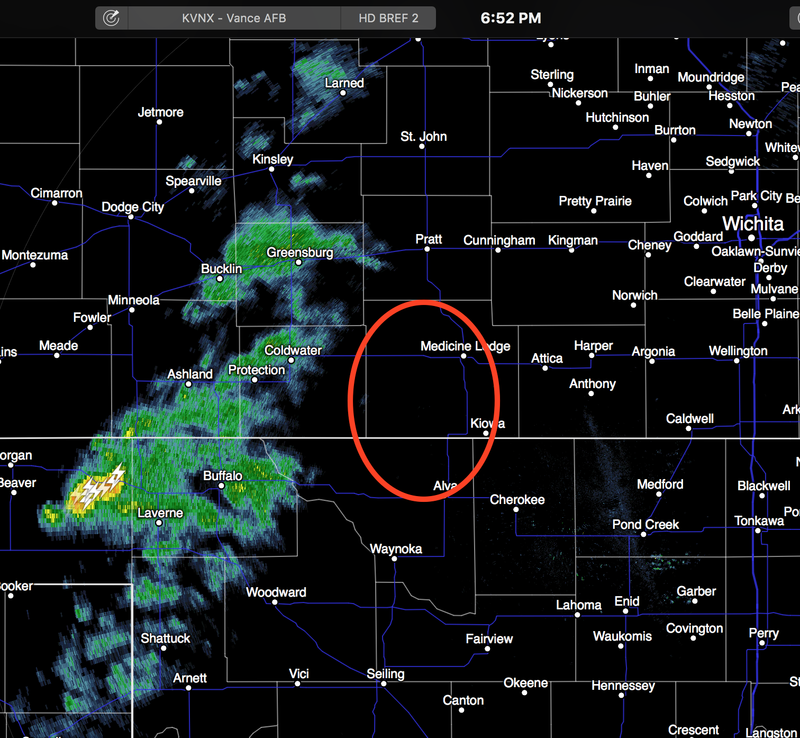 The area of rain and lightning is moving ENE. It was ten years ago this week that I sold the assets of WeatherData, Inc. to AccuWeather. It has been a terrific ten years full of new friends and new adventures. Thanks, everyone! 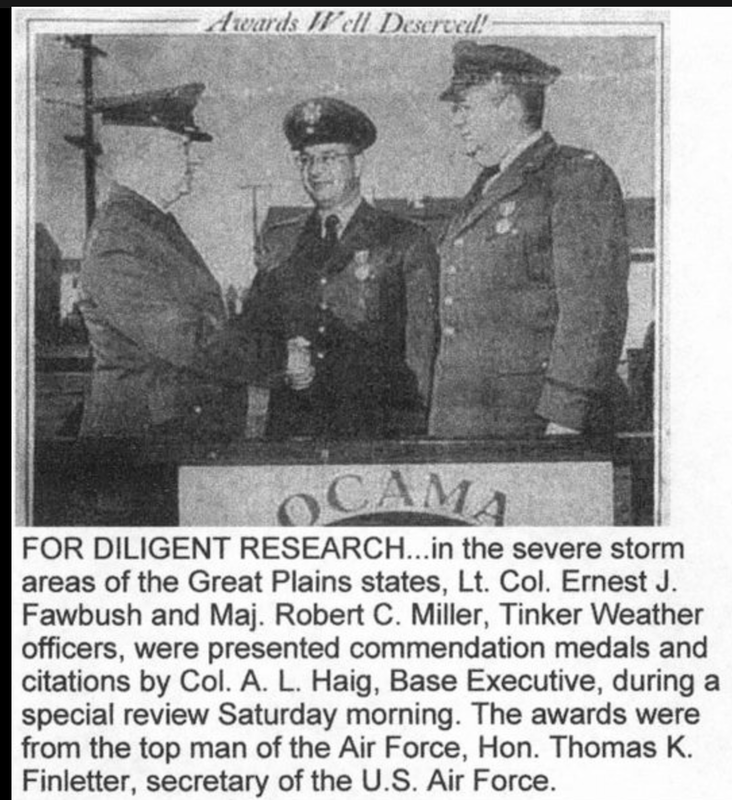 And, today marks the 68th anniversary of Fawbush and Miller's first-tornado forecast. Illustration via Facebook and Dr. Chuck Doswell. 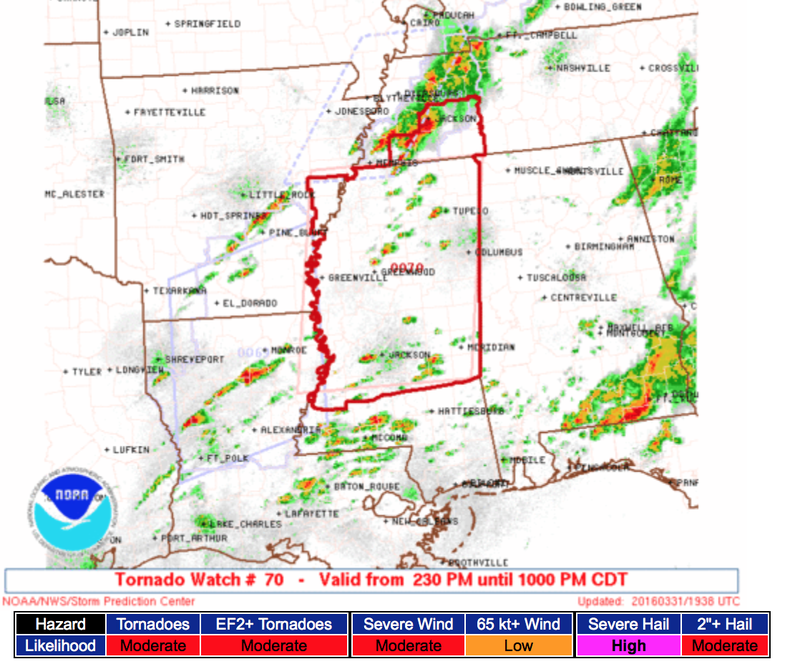 I tell the dramatic story of that tornado forecast in Warnings. 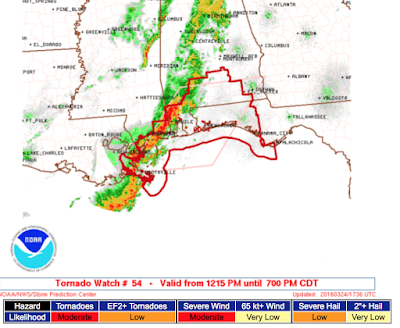 Tornado forecasts and warnings have cut the tornado death rate by an amazing 97%!! 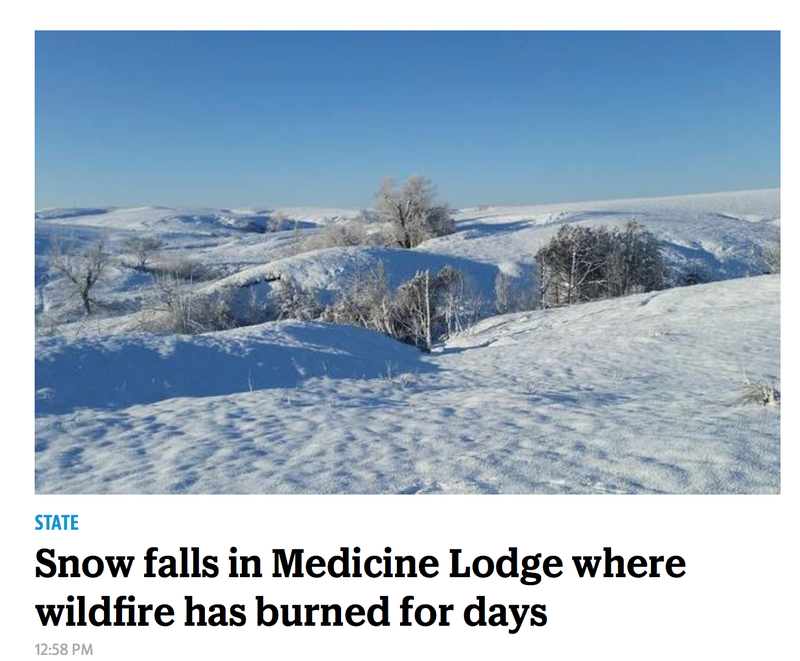 The Rockefeller Foundation has been paying for "journalists" to write the stories about the nonsensical and non-existent 'conspiracy' the sow doubt about global warming. If you live in the brown (5%) area, you are at a significant risk of a tornado occurring in your region. 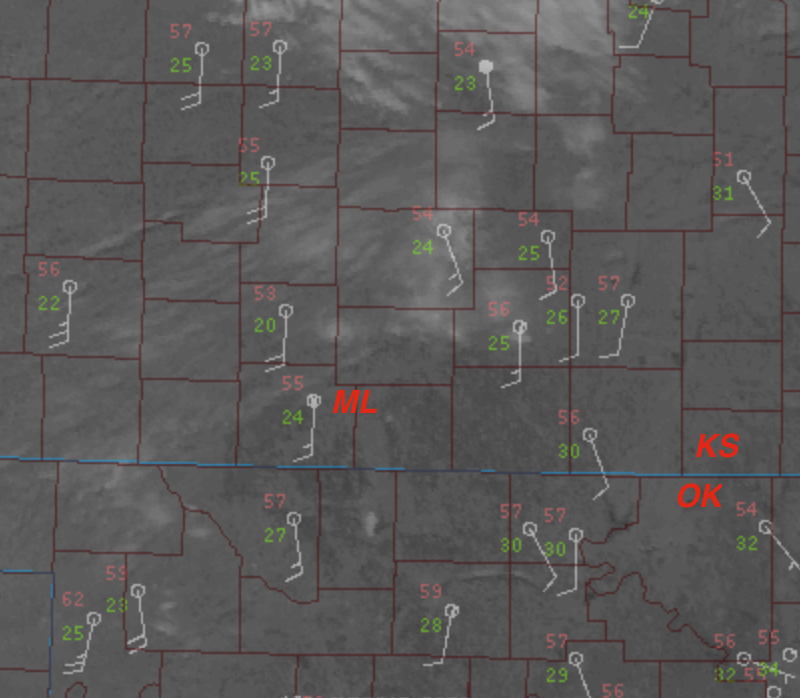 Please keep up on the weather today!! Here, via Facebook, is a view of the smoke plume from Pratt, Kansas. 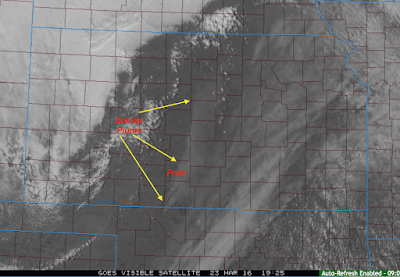 Below is a view from the weather satellite at 4:25pm CDT. 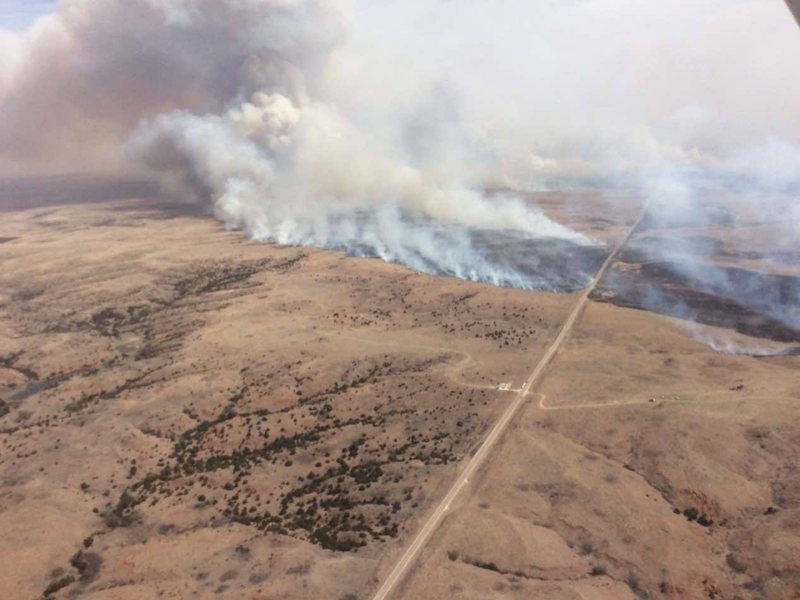 Here is an aerial photo from the Oklahoma end of the fire. It is in an area known as the Gypsum Hills which are still brown from winter but are spectacular in the late spring.